I love the Gold Coast! I’m so lucky that it’s only a 25-minute drive from my house. Even though it’s so close, I still love holidaying on the Gold Coast each year with my family. The Gold Coast has some of the best beaches in the world with clean, crystal clear water. I enjoy the relaxed vibe and all the Gold Coast has to offer. The Gold Coast Airport is located approximately 40 minutes by car from Surfers Paradise and about 33 minutes from Broadbeach. You can hire a car directly from the Gold Coast airport, catch a taxi, bus or train. I recommend hiring a car if you’re going to the theme parks, as they can be another 30 minutes from Surfers Paradise. Brisbane Airport is located approximately 1-hour drive from Surfers Paradise and approximately 1hour 10 minutes from Broadbeach. You can check out the averages on Gold Coast weather for each month here. Car hire – If you are planning on doing the theme parks, I recommend hiring a car. Bus – Buses run all over Gold Coast. They can be a cheap and convenient way to get around. Light Rail System – Tram system that runs all around the Gold Coast favourite spots. It runs from 5 am to midnight weeknights and 24 hours on weekends. This is ideal for families to explore the Gold Coast because they come regularly. Train – Trains are located on the outer areas of the Gold Coast, so you will find you will still have to catch a bus from the train station. Taxi – Cabs or taxis are available all over the Gold Coast and prices will depend on where you are going. 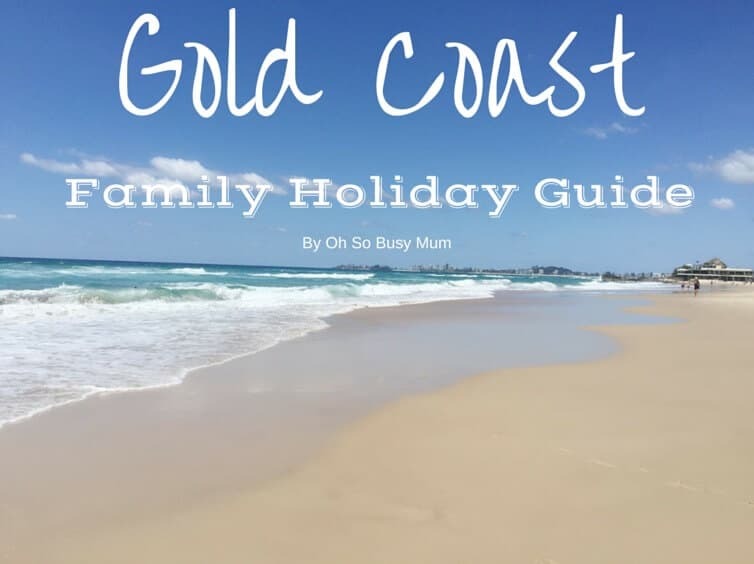 There are just so many choices when staying on the Gold Coast, so I have picked our family favourites. We stay here yearly with our family. What I love about it is the size of the rooms and having the shopping centre right downstairs. It’s very convenient for our family to have a full-size kitchen and laundry facilities in the room. The outdoor beach pool is perfect for the little ones with it being shallow, and they love playing in the sand. Mantra Towers of Chevron also have a games room, playground and movie theatre available. If you are looking for a little luxury with fantastic views, this resort is perfect for you. The beach is only minutes away, and the pool is beach style with sand and shallow areas, which is great for kids. The light rail runs from right outside the hotel which frequently runs until late at night. The resort facilities are ideal for families travelling with young children. I’m a fan of tourist parks and the family atmosphere they have. We have previously stayed at the Tallebudgera Creek Tourist Park about eight times now. And we keep going back because we love it so much. They have waterfront villas that sleep up to 9 people, full kitchens. You can sit on the balcony and watch the kids playing on the beach right in front of you. The water slides, water park and playground, is always a hit with the kids and they never get sick of this place. Harbour Town is open seven days and is located approximately 35 minutes from Surfers Paradise. Harbour Town is an outdoor shopping outlet that includes dining options and a Woolworth’s grocery store. Pacific Fair is open daily and is located approximately 11 minutes from Surfers Paradise. Pacific Fair is an indoor shopping centre that includes dining options and grocery stores. Australia Fair is open seven days and is located approximately 9 minutes drive from Surfers Paradise. Australia Fair is an indoor shopping centre that includes dining options and has grocery stores. Surfers Paradise is open seven days and late nights. Located on the main street of Surfers Paradise including a range of outdoor shopping, dining options and entertainment. Surfers Paradise beachfront markets – Lovely night markets along the beachfront of Surfers Paradise every Wednesday, Friday and Sunday evening. Carrara Markets – These markets are huge with over 400 stalls. It is open every Saturday and Sunday from 7am-4pm. Surfers Paradise Beach – is a must-visit if you are holidaying on the famous Gold Coast. Surfers Paradise Beach has lifeguards on duty during certain times and has safe swimming areas for families. Broadbeach – Is about 10 minutes down from Surfers Paradise beach. It’s not as busy as Surfers Paradise and seems more attractive for families. Tallebudgera Creek- About a 30-minute drive from Surfers Paradise, but worth it! This is an amazing beach with crystal clear water and lovely shady areas on the beach. You have the choice of the calm creek or the surf side within walking minutes of each other. Kid Friendly Places To Eat Out? Do you have any favourite spots on the Gold Coast? I would love to hear about them.